I haven't done an American Housewife review in quite some time, but now seems like as good a time as any to resume reviews. I haven't been too pleased with how few episodes we've gotten in the past few months, with a bunch of breaks thrown in much to my chagrin, but I'm glad that the show now seems to be here to stay until the end of the season. Tonight's episode looks like a ton of fun, with a birthday celebration for Greg (which coincidentally airs on my own dad's birthday, so happy birthday to both of them!) and a bunch of lies spewing from Katie. It's Greg's birthday, and the kids get him a bunch of cheap "gifts." That's still better than Katie, though, since she forgot it's even his birthday. She lies though, as tells him that she has a surprise for him for later in the night, and he thinks she's throwing him a surprise birthday dinner with friends. Katie tries to quickly put something together, and even lies to the kids about the dinner being pre-planned. She banishes the kids upstairs before the dinner, and she quickly prepares. Before Doris and Angela get there, she asks Greg to go along with a different lie (about him having surgery for a hernia), which he has a hard time with. Meanwhile, the kids start a fire upstairs when Oliver throws Taylor's shirt on a lamp. Anna-Kat tries to get Katie's help, but she refuses to intervene since it's not what she considered an emergency, so they decide to cover it all up. Katie's lie abut Greg's hernia goes off the rails, and Katie confesses that they lied about the whole thing. She covers that lie up with one about them going to couple's therapy. Greg isn't comfortable lying about couple's therapy, especially since everyone finds it believable, but Katie convinces him to keep lying about it. Oliver finds a can of paint to paint over the evidence of the fire in Taylor's room, but they end up spilling it immediately after they pry it open. Greg is starting to enjoy the lie, since everyone's blaming Katie for their "difficulties", and Katie is now the one hating it. The kids cause an even bigger mess upstairs, and knock a shelf into the wall. Katie admits that she lied about therapy, which leads to Doris and Angela telling Greg that Katie lied about remembering his birthday. Everyone quickly runs out, leaving Katie and Greg alone. Greg chats with Doris and Angela, and they all decide that Katie needs to stop her lying. Doris asks her girlfriend Chrissy to help. They stage an intervention, and Katie tells them that she only lies because she loves everyone, not because she wants to hurt them. She tells them all how she really feels about them, and patches everything up. The kids are able to cover up all of their messes, and Katie and Greg don't notice a thing. This was one of the better episodes of American Housewife since it moved to Tuesdays. Even though the show is still great, the past few episodes weren't the show's best. I'm glad to see an improvement this week, with two really funny plots and great performances all around. I really appreciated that Doris and Angela had expanded roles in this episode, as they're both far too funny to only see in one or two scenes a week. Doris was a true MVP of this episode and I laughed so much at her scenes with her husband, who she clearly adores. Diedrich Bader's Greg is always so lovable, and that certainly didn't change. He was so funny throughout the episode, particularly when he started to love Katie's lie about couple's therapy when he figured out a way to use it to his advantage. The best part of the episode, however, may have been the kids' story. Even if it didn't get the attention of the main plot, everything about it was absolutely hilarious. As always, Anna-Kat was great, but Taylor and Oliver were just as wonderful. Seeing the three of them make mess after mess, and failing miserably at their attempts to clean it up, was one of the funniest things this show has done in a very long time. 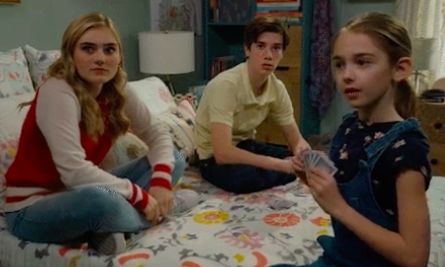 I love it when the kids are on-screen together, and this storyline was one of the best ever for these characters. The flash-forward at the end of the episode was also hilarious, particularly the line about it finally making sense for Taylor to have books in her room. All in all, a very strong episode that makes me extremely excited for the coming episodes.